Fast Fashion Fiasco: High Cost of Cheap, an exhibition of artist Joyce Watkins King’s fabric sculptures and installations, had its artist reception on September 27, 2018. 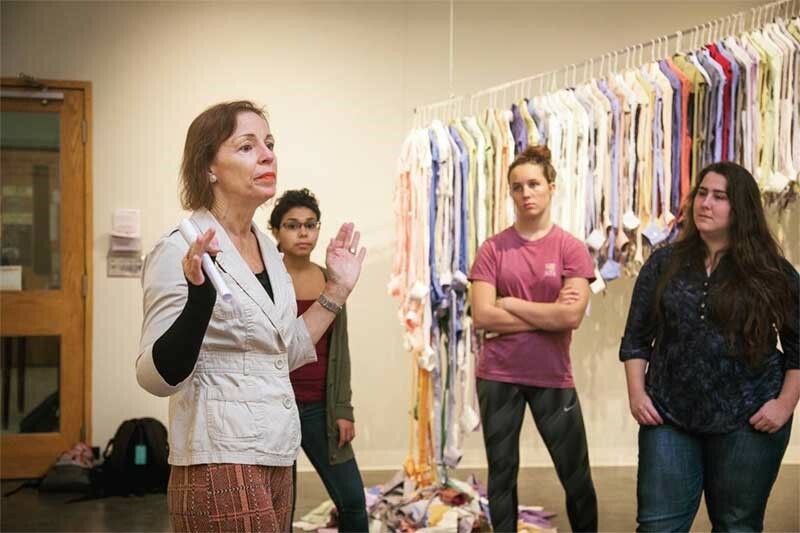 Students, faculty, and the community gathered in the Frankie G. Weems Art Gallery of the Gaddy Hamrick Art Center to observe works ranging from a ball gown of denim and Indian saris to a floating spine of denim waistbands. The exhibition, which was showcased from September 4 to October 2, explored the impacts of “fast fashion” on the environment as well as on our society. During her talk, King explained how her works addressed the societal issues of discarding clothing to keep up with trends and of the poor women in parts of Asia, particularly India, who are often coerced into making these clothes in factories and sweatshops. The reception ended with a performance by the Meredith Dance department. The performance demonstrated the inevitable consequences of “fast fashion” and the wasting of resources, such as fabric.